FRASER – On Jan. 31, the Colorado Housing and Finance Authority sold Fox Run to Fox Run Apartments LLC of Denver. According to Jerilynn Martinez, marketing and communications manager of the Authority, the 64-unit “low-income” community completed in 2002 on a $3.89 million loan from the Colorado Housing and Finance Authority sold for $1.6 million. “This was a substantial loss for CHFA,” Martinez said via email, “but not unusual when a property is acquired by a lender through foreclosure. 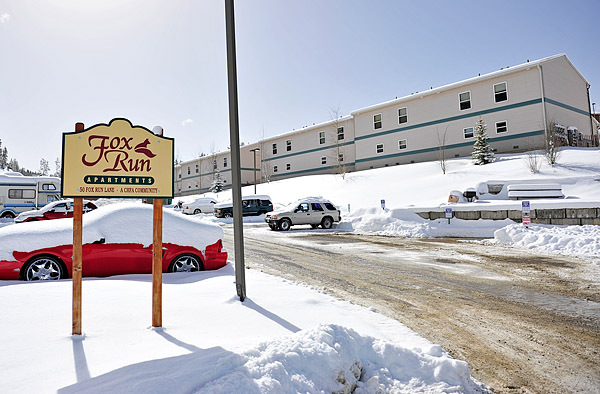 The Colorado Authority provided the permanent financing for construction of Fox Run, but a “perfect storm” of circumstances led to its foreclosure in 2009, which involved the Grand County Housing Authority. The Grand County Housing Authority has not been involved in the management of Fox Run since 2008. Mold created by lack of proper drainage on the sloping 5.65-acre lot forced the relocation of 60 percent of its occupants in 2008. Fox Run was almost 100-percent occupied before that first mold discovery. While the drainage and mold problems were being addressed at the cost of more than $100,000, the U.S. economy fell into a deep recession causing rental prices to fall across the country. In the summer of 2009, the Colorado Authority, unable to work with its borrower Fannie Mae to refinance during that period of an extreme economic downturn, was forced to foreclose on the property in September. Since then, the Colorado Authority has worked to stabilize Fox Run by addressing the drainage issues that caused black mold in many of the crawlspaces of the apartments, according to Martinez. “That mold was remediated, and it was determined the property was safe for occupancy,” she said. “Later, in 2012, we identified evidence of new moisture in attic spaces that appeared to be resulting from roof leaks that inspections showed resulted from roof damage sustained under heavy snow loads during the winter of 2011. The state housing authority was created in 1973 out of the Colorado Legislature’s attempt to address the shortage of affordable housing in the state. Since then, the authority has financed single-family mortgages for qualifying homebuyers and has supported developments of apartments for low- and moderate-income residents. Fox Run was the first property in Grand County that the state lending arm actually owned and operated due to foreclosure. At the time of the sale, Fox Run was 75 percent occupied. The apartments have not had income requirements (“low-income housing”) since July, 2012, but monthly rental rates have reflected what the local rental market can bear. According to Erin Welcome, manager of Fox Run since 2010, the new owners are planning to upgrade the property and “make it nicer.” The unspecified upgrades will include fixing the leaky roofs, but when reached, a representative of Fox Run LLC said the company was not yet ready to share specific details of improvements.